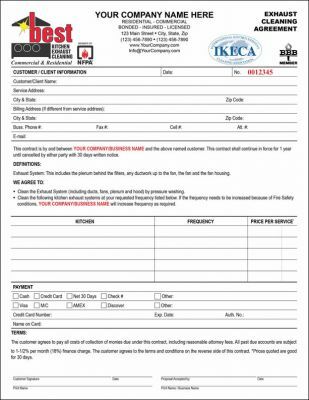 All purpose kitchen exhaust cleaning contract and agreement proposal with general terms and conditions on backside of form. 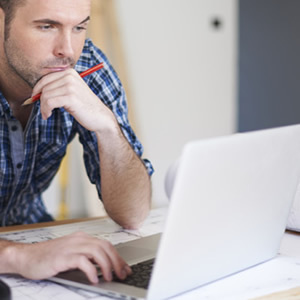 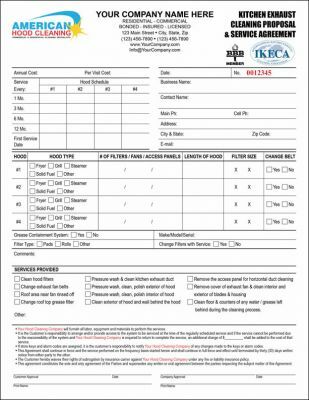 The form contains areas for customer and billing details, areas to be cleaned and maintained, general terms, payment and customer signature section. 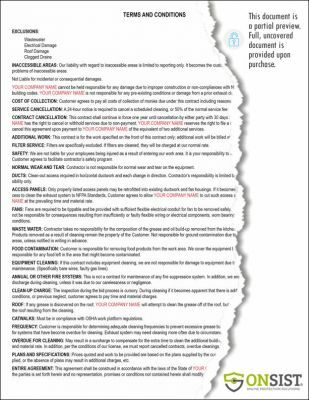 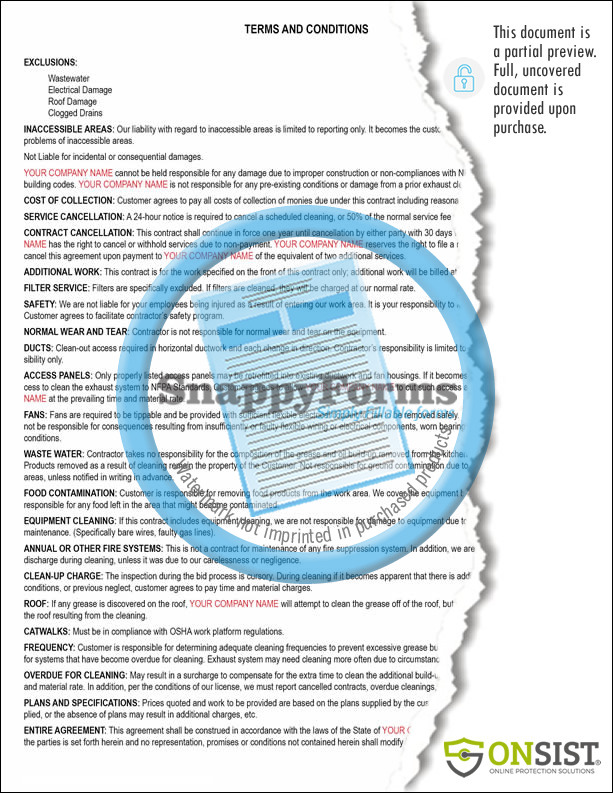 General, industry standard maintenance terms and conditions for back side of form. 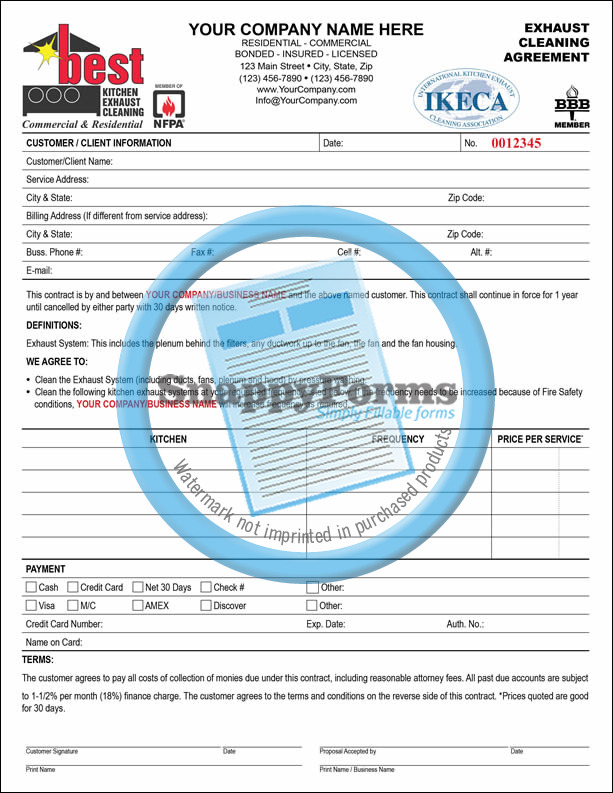 eForm Features: The interactive PDF form allows you to fully edit all text in the form, including form field labels such as "Name", "Date" etc., edit form section headings, you can also, insert and edit your company name and contact details, edit your company's name and address fields to any of 7 colors, also change the form's title heading to one of 7 colors, and also change the form's text to one of 7 colors, place your business logo and any other trade images you may want, auto form numbering to move form numbering forward or backward or use manual invoice numbering, invoice numbering system also allows manual setup for a mix of letters and numbers, setup the form with your state sales tax for auto tax calculation, allows for some sub total items in total summary area to be taxed -or not taxed- (this may be useful if doing work for a non-profit organization (see State laws), form is self calculating with full math functions, full accuracy, 3 data text input colors, digital signature if device capable, flatten form and e-mail, fax or hand deliver. 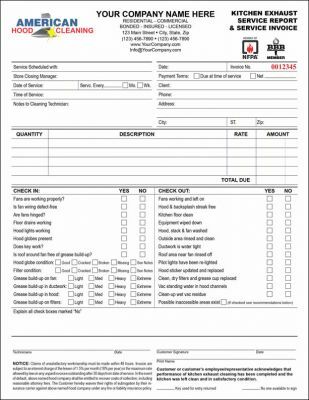 Can be used for digital or manual entry.